Restore a warm, welcoming glow. Brass, whether fashioned into a tray, a fireplace fender, a decorative object or a vase, emits a wonderful golden glow which can enhance almost any d�cor. Sooner or later, however, depending on your climate more than anything, brass will begin to show a dull brown or green tarnish that needs to be removed. When houses were heated mostly by coal furnaces, many housewives turned away from brass because the residues of coal fumes made brass tarnish very quickly. Fortunately that is no longer the case. 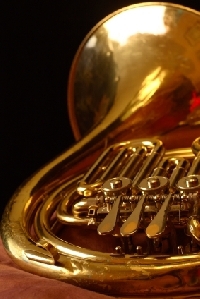 Before you begin, determine whether your brass objects are lacquered or not. If most of your object looks like new with only water spots and small darker areas, it is probably lacquered. Contact a jewelry store, large department store or the original retailer to find out how to clean lacquered brass. Regular brass polish will only scar the lacquer, making the problem worse. Some pieces of brass like a fireplace fender are too large to handle easily. Consider spreading your newspapers on the kitchen floor or taking your project outdoors. As the polish can will remind you, you should always provide ventilation when dealing with metal polishes. The way they remove tarnish involves a chemical reaction between the polish and the metal, and you need to limit your exposure whether through breathing or bare skin. Some pieces of brass such as door knockers and door handles cannot be brought to a work area but must be polished in place. Surrounding a knocker or other brass with a wide border of masking tape will protect your painted surface. You may wish to add cotton swabs to your tools to reach small or detailed areas. Use them also to remove polish residue as you clean up. Articles that are heavily incised or filled with delicate detail can be polished in another way so that heavy rubbing does not destroy their surfaces. This can be a problem with old brass or articles from India and China. For commercial brass polish that cleans partly by abrasion, an antique-collecting neighbor substituted ketchup. The acids in the ketchup remove tarnish without rubbing hard on delicate detail and the results are remarkably good. Rinse, dry and enjoy the warm and welcoming glow that polished brass brings to your home.